The tunnel has a working section up to four metres high and 12 metres wide, making it the biggest in the Southern Hemisphere and large enough to fit a small truck. It can produce winds of up to 180kmh. The tunnel has a team of dedicated staff and costs in the order of $10,000 per day to hire out to commercial enterprises wanting to obtain data. The tunnel has played host to a variety of elite sports people over the last few years including Cadel Evans, Australian down hill ski team, Australian skeleton team (like luge, but head first) and others. The wind tunnels have also been used to test the aerodynamic forces of cars, V8 Supercar teams and the remodelling of the Spencer Street train station. A balance in the centre of the tunnel has four electronically sensitive pressure sensors underneath a rotating plate, when the wind blows over the object mounted on the plate, the pressure it causes on the sensors can be interpreted as a drag reading. The plate can be rotated to allow for testing different angles of yaw. The whole apparatus measures in milliNewtons (one Newton is about 102 grams, 1 milli Newton is 0.1 grams) and is highly repeatable. A bike is mounted to front and rear supports on rollers which allows the cyclist to pedal and have the wheels move. The session had been organised by Raoul Luescher (aka transitions:Whodesigns), who has worked for a considerable period with the AIS and other aero experts such as John Cobb. At $500 a throw, not cheap, but hopefully of benefit. transitions:Dalai, transitions:fishboy and a track cyclist (let’s call him Mr X) had ponied the cash and were eager to see what a day in the tunnel could do. The first hurdle is the legal agreement - sorry guys - can't tell anyone the data - which does make it more challenging to publish results. The reason for this is to prevent bike and or other companies getting free data which they would otherwise have to pay 000's of dollars for. Fair enough - they sting us for the bling so, make em pay to convince us to buy their gear. Legal agreement out of the way, and coffee consumed. Time to get a bike in. Fitting Dalais ride into position: Few minor adjustments with the jigsaw! Whodesigns adjusting the front wheel to get it into position. Dalai was first and had to have a few running adjustments to the tunnel apparatus to get it to fit ... his P2 was a very short 92cm axle to axle which necessitated a quick run with the jigsaw to get the rollers close enough together to fit the rig. 40kmh doesn't sound that fast, but is a bit of a blast if you walk from the calm side of the tunnel into the 40 kmh air stream. The other issue is it can get a bit cold... particularly if you are just wearing a tri suit. Baseline position readings are taken still and pedalling for your "standard" aero position, then Whoey sets out trying to find you some more speed. Generally, unless you are interested in effects caused by rotating wheels, the measurements are taken in a still position. The bouncing nature of the pedalling action affects the readings on the pressure sensors and it is easier to spot trends while remaining as still as possible. 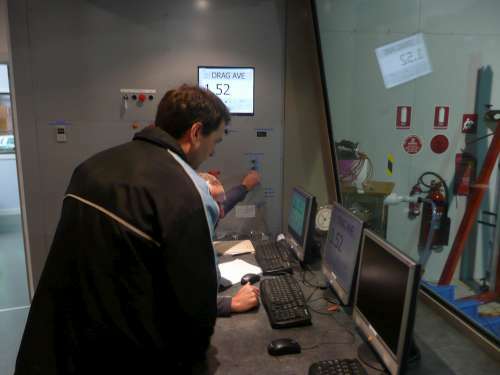 The drag figures are visible inside the control room from the tunnel floor, so while the cyclist can't see the drag currently (they would have to turn their head, kinda defeating the purpose), the staff directing have a pretty good idea of what the numbers are and what to try. First test was Dalais hands moved back to mid aero bars, instead of gripping the bar ends - no good! 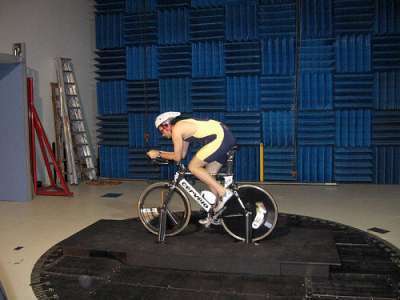 More than 10% additional drag over gripping the end of the bars. Quite a few other tests were done, swapping one position or piece of equipment at a time, and gradually reducing the drag each time. 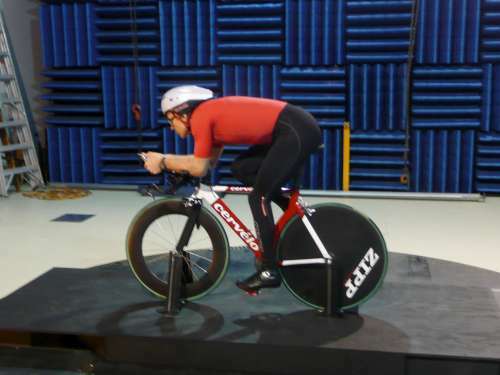 According to whodesigns, a very effective way to go fast is to find an aero position and adapt to riding it - this is what Chris Boardman did for the 1 hour time trial - a record that is still standing. Some other changes included flattening out Dalai's back, and getting him to turtle his neck a bit more. 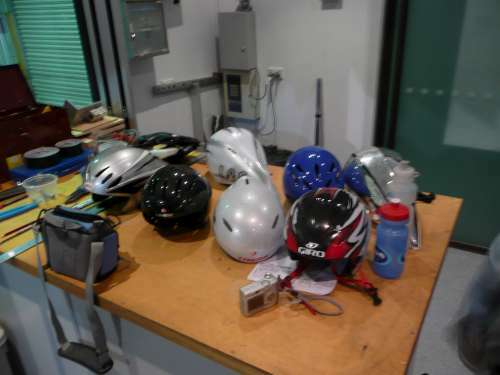 L to R: Bell Meteor II thanks transitions:AndrewT, Limar Speed Demon, LAS Chrono (back) thanks transitions:Freak, Limar Chrono (front), Giro LA TdF special (back) (whodesigns), Giro Advantage2, Uvex FP2 thanks transitions:Otter. The final position was close to a 50 watt reduction in drag which is the difference between riding 38.5 and 42 kmh at the same power. Pretty astounding really, and no way that $500 spent on ANY bling would ever get you that fast, that quickly. Next up was Mr X testing a track bike and various wheel combos at a much higher fan speed of 55kmh (275 rpm, but much chortling in the control room when they almost set the fan to 2758 rpm). Being at higher speed than the 40 kmh for Dalai, the drag readings were a lot higher. Mr X's tests included seated and sprinting positions, and finished with a series of wheel tests which showed that one particular wheel combo was at least 1% better than another. Finally Fishboy gets to have a go, and after extensive testing (1.5 hours) in the breeze, manages a very slight improvement. Turns out the swimming shoulders have got to go, and as soon as I figure out how to do this and still be able to swim, I'll be right on it. Baseline (before) - good view of the rotating plate too. Testing LA TdF Giro - shame you can't buy these! Without any doubt, the testing in the tunnel will give you a competitive edge that (at the moment) few other people will have. If you are more than moderately serious about riding the bike fast, then my advice is to get in there! Whoey has suggested that there will be some more of these days in the future. Thanks to transitions:Whodesigns for organising the day, and David Burton and the top engineering team at the tunnel. Cancellara's Olympic time trial was awesome, put 30 seconds into Larsson (2nd) on the last descent at speeds close to 100kmh. It's not about the bike - it's about the rider on it. A Cervelo in the tunnel had 10 units of drag. A track bike had 15 units of drag. 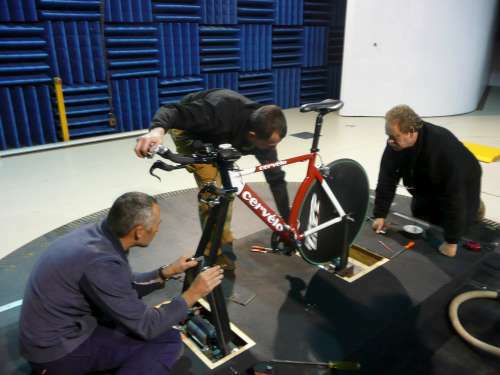 A cyclist on the Cervelo had 380 units of drag. Endless arguing about this bike or that bike being more aero is pretty pointless, it is about how the cyclist sits on it that counts. that is what Chris Boardman did for the (still standing) 1 hour record. Minute, tiny, seemingly insignificant position changes can bring about big improvements in drag. Dalai's hand change from aero bar end to aero bar climbing (gripped half way down) was a big increase in drag (roughly 10%). When tired, it is even more important to ride aero. Sitting up, moving around etc all less aero and more taxing than your best aero position. 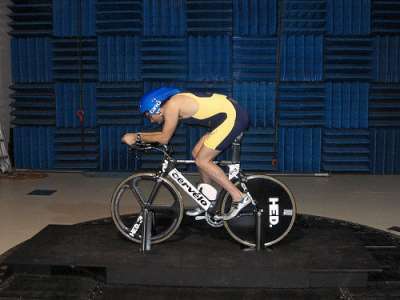 For best results with an aero helmet, try to close the gap between the underside of the helmet tail and your shoulders.